Heavyweight champion Anthony Joshua has moved back into his mum's two bedroom flat in north London despite earning £15million from his famous win over Wladimir Klitschko at Wembley. 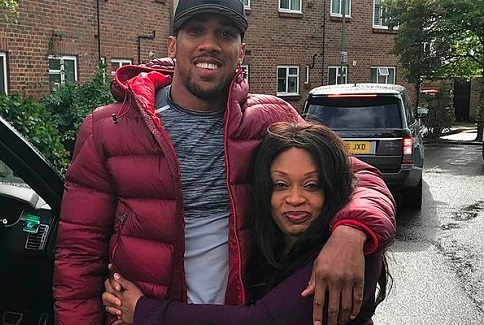 Joshua is being tipped to become the first billionaire boxer following his memorable victory but he is refusing to get carried away with his wealth and loves nothing more than spending time with his mum Yeta Odusanya. AJ might well be a multi-million athlete and brand, but he is comfortable living with his mum, who is a social worker. The 27-year-old certainly looked relaxed as he boarded his state of the art transport from his ex-council flat and was accompanied by security. Joshua is determined to settle back into normal life and is keen to get away from the spotlight despite the cameras following his every move. The heavyweight champ has always made clear the importance of his family and banned his mum from attending the recent heavyweight showdown at Wembley. Yeta has not been to see her son in action since the London 2012 Olympics as Joshua says she would put him off as they are so close.